A point-and-click detective crime story type text-and-voice adventure game by Hideo Kojima, loosely based on his previous game "Snatchers" in the same style. It tells the story of former Police astronaut Jonathan Ingram, as he has to travel out to the space station Beyond Coast to solve the mystery of the disappearance of Kenzo Hojo, an employee of the gargantuan company Tokugawa Pharmaceutics. The game boasts tremendous information dumps about space travel and living in space, and the unfolding drama and story raises, in typical Kojima style, several questions on our society in general. 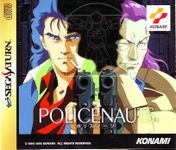 Policenauts was first released for the japanese OS PC98, but then ported to 3DO, Playstation, Saturn, and lately to the PS3 and PSP.